The eye area is 3-5 times thinner than the rest of your complexion, and is one of the first places to show signs of age. 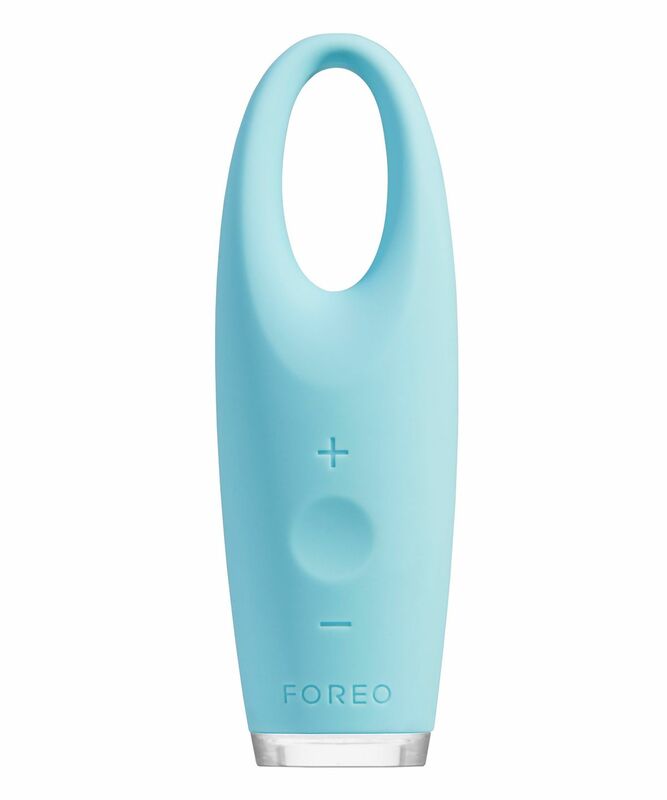 FOREO’s travel-sized IRIS Illuminating Eye Massager vibrates and pulsates over the eye area to encourage drainage, promote circulation and stimulate cellular turnover. The result? Fewer fine lines, reduced puffiness, enhanced skin density and a firmer eye contour. The skin around your eyes is subject to a lot of daily ‘wear and tear’ – you blink 10,000 times a day on average, and with 24 muscles (14 of which move every ten seconds), it’s no surprise that eyes are first to betray signs of time, stress and sleep-depravation. 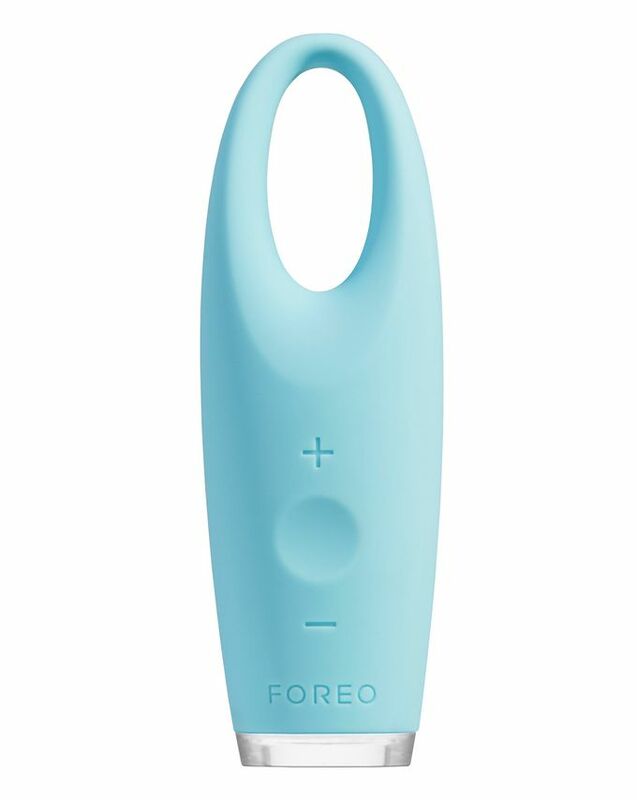 The ultimate foil for dark circles, bags, crow’s feet, crêpey-ness and puffiness, FOREO’s IRIS Anti Wrinkle Eye Massager has been designed to emulate ‘fingertip massage’ – with two modes to stimulate elimination of accumulated toxins and help to fortify skin’s fabric. Pure Mode is incredibly gentle – perfect for maximising absorption of your eye treatment whilst giving fragile skin a mini ‘workout’ – while Spa Mode combines delicate pulses with contour ‘tapping’ to mimic a professional, anti-ageing facial. Ergonomic and lightweight, this device is 100% waterproof, features eight speeds and provides up to 140 uses per charge. 1. Apply regular eye creams or serums with fingertips. 2. Apply the device on the eye contour from the centre to the exterior, and under and above the eye. Hold the device still on the same place for a moment - then move on to the next area. For optimal results before using the IRIS, use a LUNA device for deep cleansing to allow the skin to breathe and be more receptive to the eye products used with the device. I had no idea a product like this existed on the market - I just knew that I had terrible puffiness under the eyes that made me look tired and sick. I tried several creams and masks but nothing worked as well as IRIS. I'm 28 and I finally look my age, sincere recommendation! I’ve been using this product for nearly 3 weeks now but can’t say I’ve seen much improvement to my fine lines and wrinkles. One downside is it’s very noisy and I feel it tugs at my skin more than if I were to do it myself using my ring finger. I use this in the evening and in the morning with my eye cream. I noticed the fine lines around my eyes are slightly better, and it really helps me with puffy eyes in the morning. I have been using it for a while and I’m totally amazed by the results. I feel the small facial lines around my eyes have gotten smoother and smoother. It also reduced my dark circles and puffiness. My eye cream absorbs much better and everyone keeps complimenting me on how refreshed I look. I owe that to this amazing product. I love coming back home from work and do my eye massage. My friends used to make fun of me, but when they tried it, they loved it. Really good stuff.